In 1887 James Stark erected a combined grocery store and residential apartment at 12 Northumberland Street, Ayr. That’s not so surprising as James, and his wife Julia, were born in Scotland. However, the Ayr that James built his store in was in Waterloo, Ontario. James arrived in Canada aged 20 in 1865 and worked for a dry goods store in St Catharine’s Ontario, then in Brantford, Toronto, and then for 8 years in Ayr. He arrived in Vancouver in 1892 aged 45 with his wife and five children aged from 7 to 18. He opened a dry goods store at 226 Carrall Street, then moved a few years later to 32 Cordova Street in the Callister Block. 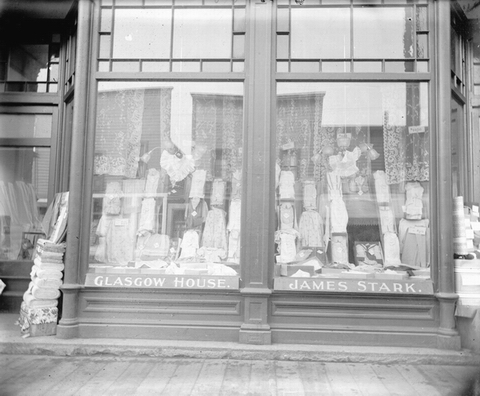 By 1897 (when this picture of the storefront was taken) the business was known as Stark’s Glasgow House – although it’s not entirely clear why as James was born in Dundee. In 1901 he was living at 1027 Robson Street with his wife and all five children. The business offered both dry goods and millinery and two sons worked with their father, joined by the youngest son William in 1903. 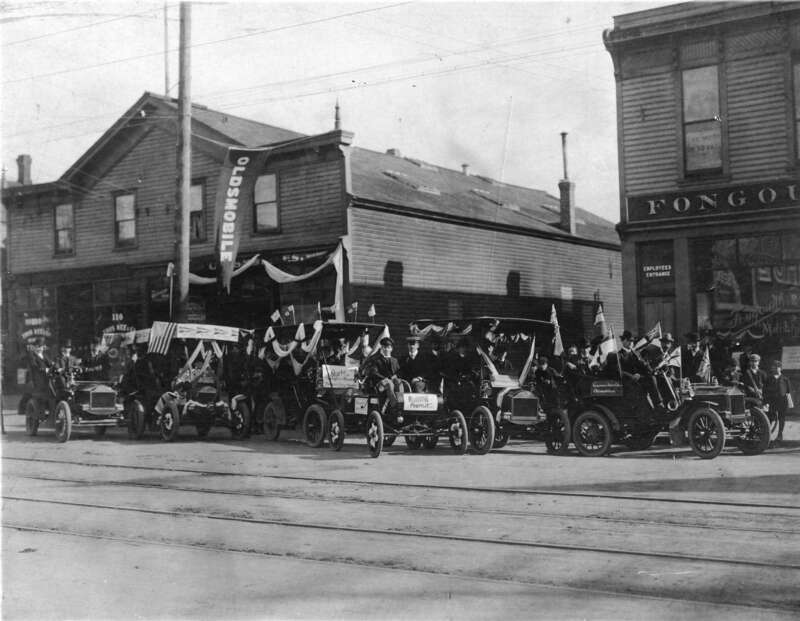 In 1904 the business moved to their third location in 12 years; the one in our picture: the five-year old building initially built by McDowell, Atkins and Watson, on the south-east corner of Cordova and Cambie. In 1905 the business was incorporated under the name of James Stark & Sons, Ltd., with James as president and sons Walter as vice president and Earnest as secretary and treasurer. They stayed in the building until 1909 when Stark’s Glasgow House moved to Hastings Street and became a full-scale department store. The family moved to 1201 Harwood Street, although only Earnest was living with his parents; Walter lived on Davie Street. By 1912 James had moved to Shaughnessy Heights and Earnest and Walter had moved to West Point Grey. The VPL photograph shows the building around 1905 soon after Stark’s first moved in. By 1910 it was the Carlton Cafe, and soon after the Carlton Hotel. During the 1960s there were four partners running the hotel, including Maurice St Cyr, and you could get a room for $40 a month. The building became a single room occupancy hotel known as the Cambie Hotel and the Gastown Inn, but in 1997 it became the Cambie International hostel with over 120 beds and the Cambie pub downstairs.